After taking second twice, Spain’s Núria Picas nailed it this time for the women’s win. In the men’s race, it was now-three-time champion, France’s François D’haene, who emerged at the front of the huge field of top male competitors. In doing so, both became 2017 UTMB champions. The entire field of runners encountered difficult weather conditions at times with rain, snow, and wind. 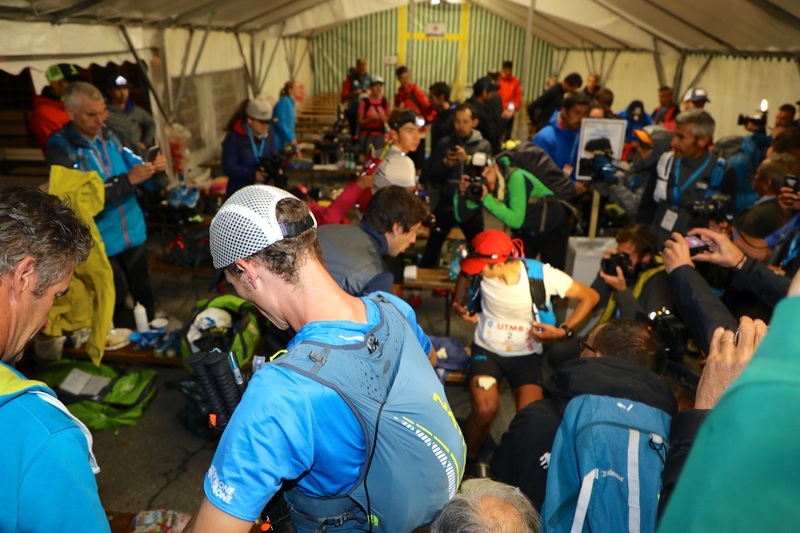 A volatile weather forecast led the UTMB race organization to make two last-minute modifications to the normal course. They removed the technical and steep up-then-down Pyramids Calcaires in Italy, which was a new addition to the course in 2016, as well as the normal route between Vallorcine and La Flégère near the end of the race, which normally travels via a high and appropriately named pass called Tête aux Vents, to take a lower and unexposed path. The resulting 2017 modified route was a couple kilometers shorter–quoted at 166.9 kilometers by the race organization–and with a bit less climb and descent. On Friday evening, September 1, the race fired off west from its Chamonix, France starting line to travel a counterclockwise loop around Mont Blanc while traveling through France, Italy, Switzerland, and back to the same square in downtown Chamonix. The race saw 1,685 finishers and 852 DNFs. 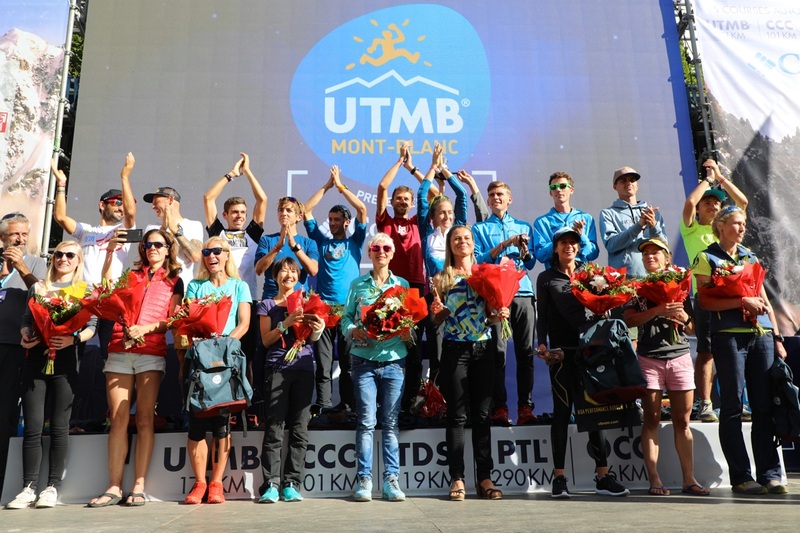 In addition to this article, you can find our full play-by-play of the race as well as a collection of our pre-race interviews and previews on our UTMB live-coverage page. And check out our photo gallery from the awesome Kirsten Kortebein! As usual, we’ll be updating this article with additional results as well as links to UTMB-related articles, photo galleries, and race reports. Check back. A special thanks to Camelbak for making our coverage of UTMB possible! Thanks also to GU Energy and Altra for their support of our UTMB coverage. To get all the latest ultra news from iRunFar.com, subscribe via RSS or email. It is decided: France’s François D’haene (pre-race and post-race interviews) is the king of long mountain ultramarathons. If any of us wasn’t sure of said statement ahead of this race, surely we all were convinced as we watched François become champion of this best-ever-assembled group of men in a trail ultramarathon. And let’s be real here, he didn’t just win, he dominated. From start to finish, it was François who was right there, either setting the pace or matching whomever else was doing so. François shared the race’s first marathon with several different men–but all of the expected ones–including Kilian Jornet (post-race interview), Jim Walmsley (post-race interview), and Xavier Thévenard (pre-race interview). Eventually, Xavier lost contact off the back of this group while climbing to Col du Bonhomme at a little over 40k into the race and just after dark on Friday night. From there, it was the remaining trio who ran closely together to the 90k mark at Refuge Bonatti, which lies high on a ridge above Val Ferret in Italy. This trio traveled accordion-style, spreading out by a minute or so at times, depending on the terrain and time spent in aid stations. 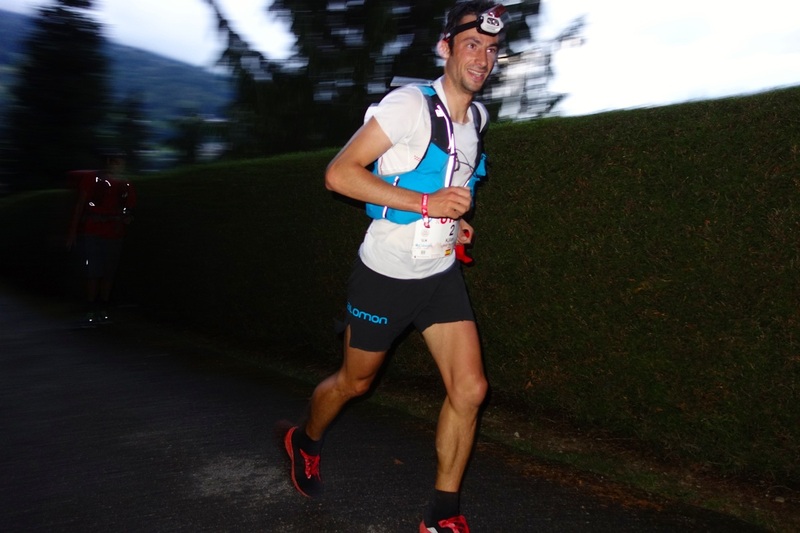 However, at 90k, Kilian began to lag behind, arriving there four minutes behind François. And by another 20k after that, in the village of La Fouly, Switzerland at dawn on Saturday morning, Jim, too, said good-bye to the lead. While Jim arrived to La Fouly close to François, he was tired and needed recuperative time before hitting the trail again. For the race’s final 55 kilometers, François slowly but surely created space between him and the rest of the men’s field. And, I need to say, his efforts brought what felt like the entire Euro trail community out onto the race course to cheer for him–in an energetic but also, at times, too-frenetic way. Case in point, they created a 30-minute, dead-stop traffic jam in Vallorcine, which is 149k into the race, when about five of them simply left their cars in the driving lanes to watch François run by on the trail next to the road. No joke. Back in Chamonix, on the 1.5k glory run through town to the finish line, François ran through a sea of humans filling the route, wanting a glimpse of him or a slap of his hand. A huge smile upon his face, his arms lifting now and then to clap and fist pump, François swam that sea and crossed the line as 2017 UTMB champion. Since 2009, I’ve been watching Spain’s Kilian Jornet run and race. Since 2009, I’ve watched him find relative ease in racing trail ultramarathons and dominating men’s fields within them. And, since 2009, it’s been exactly twice that I’ve seen Kilian worked over by these types of races, the first when the heat got the best of him at the 2010 Western States 100 and the second this weekend when the fast pace slowly but surely wore him down. Kilian would say after the race that he loved the first half of the race and suffered the second, but if there’s anyone who can suffer better than Kilian, I would like to meet him or her. The first glimpse we had that François might be the better racer on the day between he and Kilian was at the 64k mark above Lac Combal when we watched François slow to wait for Kilian after a downhill section. 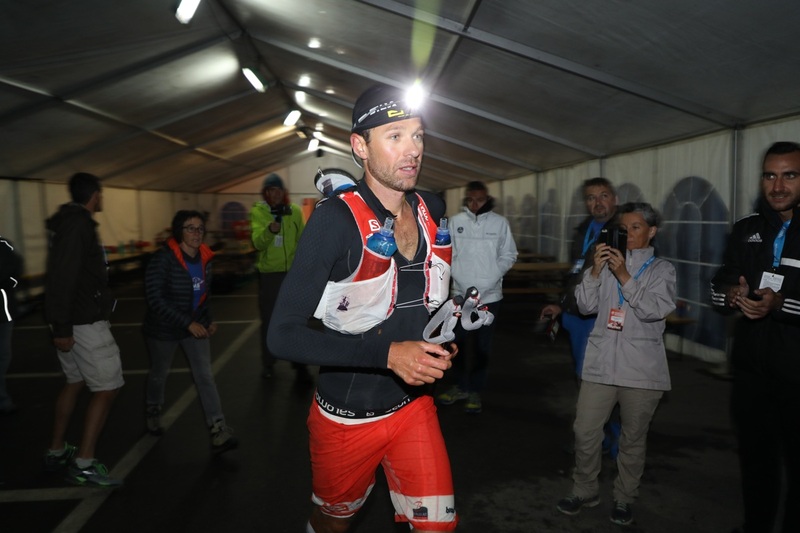 But it was another 26k later at Refuge Bonatti where the fatigue of the day had accumulated enough and Kilian arrived some four minutes after François. At pretty much each checkpoint after that, Kilian dropped back a little more. However, in total fairness, he looked happy, was running well, and still looked like the Kilian we’ve grown to expect. That is, until the final checkpoint at La Flégère, about 7k from the finish. Kilian was well and truly whooped there! In the end, Kilian is still Kilian, a downhill running legend, and we watched him hammer some of that last long downhill back into Chamonix to take second, 15 minutes off the lead. Kilian is an enormous fan favorite, and fans filling the finish line roared as he ran the final straightway and across the line. It’s two for two for American Tim Tollefson (pre-race and post-race interviews)! Tim proved that his 2016 third-place finish was definitely no fluke by doing it all again. 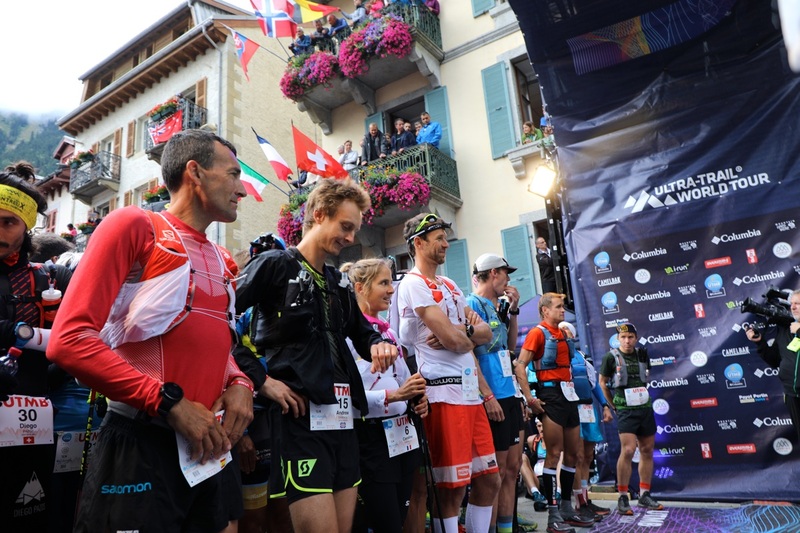 At the first spot iRunFar’s reporters were stationed, above the village of Saint-Gervais a little past 20k into the race at sunset Friday night, Tim looked calm around 15th place. Another 20k later at Col du Bonhomme, in the snow, wind, and below-freezing temperatures offered there, he’d cracked top 10 and was looking unbothered by the weather. Another 25k after that, at above Lac Combal in Italy, and he’d moved up to seventh position and looked like his race was just starting. To paraphrase Jim Walmsley after the race, Tim hit the Italy-Switzerland border at 100k and flew. 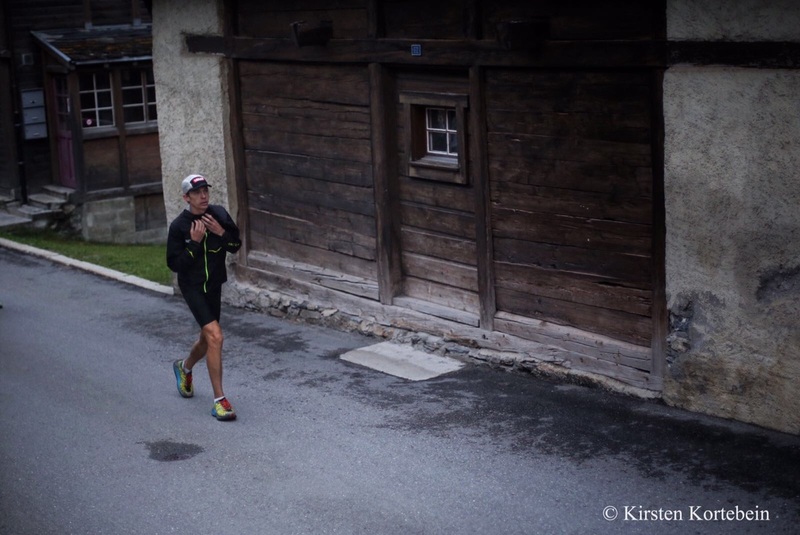 Moving into third place at Champex-Lac, Switzerland, 123k, he would run unchallenged by anyone behind him to the finish line. The dude knows how to celebrate at the UTMB finish. Huge smile, high fiving the crowds, high-knees running up and down the chute–his party, his way. France’s Xavier Thévenard (pre-race interview) knows how to execute. Ahead of the race, he said that his goal was to run 21 hours, no matter what the men’s field was doing around him. Last-minute, weather-induced course changes shortened the route by an estimated hour’s worth of running for the lead men and, what do we have here, but a 20-hour finish for Xavier? He ran the first 35k or so in contact with the lead runners, but let them go on the long climb to Col du Bonhomme, the race’s marathon mark on a high pass in France, to do his own thing. Several times going into different checkpoints, we saw Xavier checking his watch and checking in on his race plan. At the finish line, he said that the weather conditions were hard at times, as his hands got so cold that it was hard to eat. That said, I think his finish time matched his goal, and he sat at the finish with what looked like a content, yet fatigued smile in fourth place. The USA’s Jim Walmsley and his 100-mile racing is just so entertaining. The dude is inordinately talented, fit, and driven. But what he and his 100-mile racing is so far confirming is that 100 miles on mountainous trails requires a significant mental component–it’s not just physicality anymore. If Jim can figure out the psychology and strategy of racing 100 mountain miles, watch out world. That said, Jim’s fifth place should not be discounted: the only guys to beat him collectively have eight UTMB wins, a second, two thirds, and a fourth–and nothing else in their combined 12 runs at UTMB. For about 100k, Jim ran at or near the front of the race, with François and Kilian. It was clearly a struggle for him to stay with these guys at times, though, to run the pace of two very experienced mountain ultramarathoners and not run ahead. At 110k in La Fouly, Switzerland, Jim arrived close to the lead, but tired, underfed, and with blistered feet. He took significant breaks in La Fouly and another 13k later in Champex-Lac to address his various issues. These breaks and a general slowdown lapsed him back to seventh position. His energy and competitive drive eventually returned, though, and he clawed back a couple positions to finish fifth. After the race, Jim said he’d learned a lot and was already eager to race UTMB again. Spain’s Pau Capell had a great race, backing up loads of stellar results in 2016 and early 2017 with a sixth-place finish here. He created some fun finish-line drama by hunting Jim just 100 meters back or so and forcing Jim into run sub-six-minute-mile pace through the streets of Chamonix to hold onto fifth place. The USA’s Dylan Bowman nailed it for seventh place in his first UTMB finish. In speaking with him after the race, it’s clear he’ll go home happy but hungry for more. Lithuania’s Gediminas Grinius (pre-race interview), who finished second last year, battled an old injury to eighth place this year. Zach Miller did not have his best day but he still managed to run into the top 10 with ninth place, helping put four Americans in the top 10, more than any other country. Tenth place, Spain’s Jordi Gamito, might just have been one of the happiest guys in the field. He seemingly wore a smile all day, night, and day. Last year’s fourth place, American David Laney (pre-race interview) ultimately took 14th. Pre-race favorites Jason Schlarb and Sage Canaday, both Americans, had off-par days but each made it to the finish in the 26-hour range. 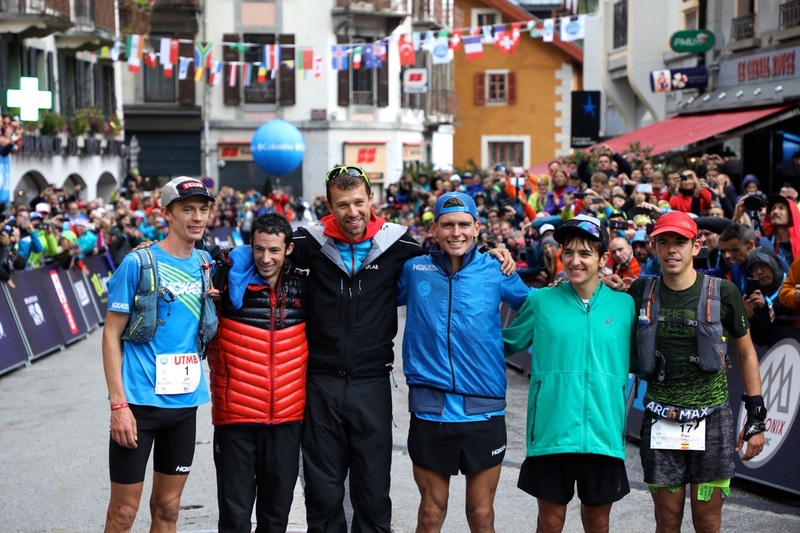 Some notable withdrawals, Tòfol Canstanyer and Miguel Heras, both of Spain, good friends, and who spent much of the race running together just outside the men’s top 10, would both DNF, with Miguel making it as far as Trient, Switzerland, just 25k from the finish line, before stopping. That all said, I think the drop rate among the highest-echelon men was overall quite low. It’s true, the reign of Spain’s Núria Picas (pre-race and post-race interviews) has returned. New fans of trail ultrarunning might not know her name as she’s been on a physical and mental break from international racing for the last year and a half or so, but in her heyday of 2013 to 2015, she was close to unbeatable. And, now, she’s back. Núria set the pace of the women’s race pretty much all night, all day, and into the night again. For some 130 kilometers, she looked like the Núria we know: calm and quiet in outward psychology, lightfooted and efficient in physical state, and damn fast. 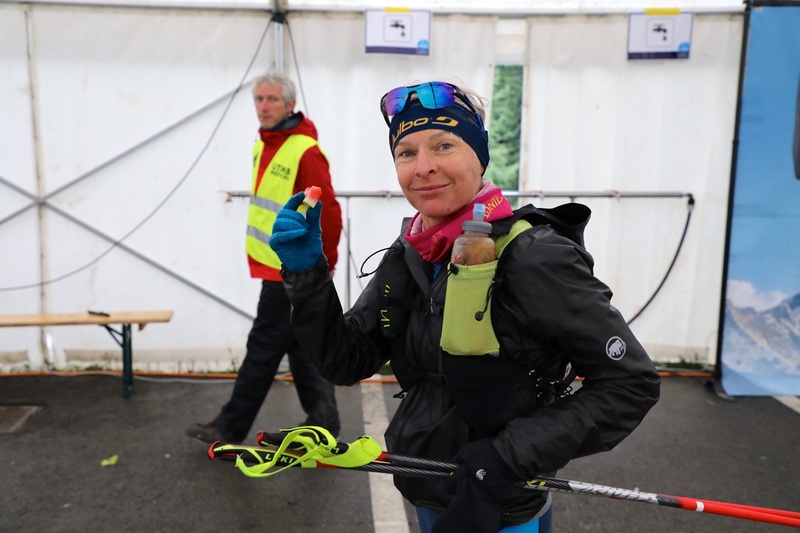 With the exception of the first 20 kilometers where she shared the trail with several different women, no one amongst this year’s competition could ultimately keep her pace. In the race’s final 30 or so kilometers, Núria suffered some breathing problems which made running almost impossible. She was thusly forced to walk much of the final downhill into Chamonix and the roads through town. When she crossed the line and became the 2017 UTMB champion, her face was a mix of emotion: happy, shocked, and, well, tired, too. In speaking with her after the race, it’s clear that Núria’s competitive fire has returned. Switzerland’s Andrea Huser (pre-race and post-race interviews) is really something else. 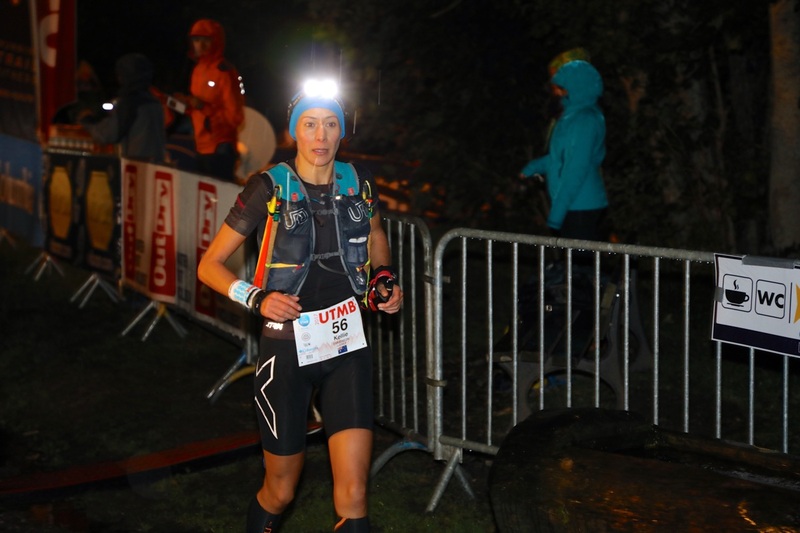 At just over 20k into the race, above the village of Saint-Gervais at about dark on Friday night, Andrea told us, “I’m tired.” And she didn’t look her springy self either. She was running in the women’s top 10 there, but it looked like it was taking significant effort to do so. But, little by little, as the night went on, Andrea said after the race that she began to feel better. Her position relative to the rest of the women reflected this, too. In the earliest hours of Saturday morning, as the distance and bad weather began taking its toll on the field, Andrea kept moving up. By 90k, she was in third place and in second just 10k later. Andrea’s competitive story wasn’t over there, though. Because Andrea was moving well and Núria was walking much of the final seven kilometers, Andrea crept very close to the winning position. In the end, less than three minutes separated them, an incredibly small spread after 166 kilometers of racing. France’s Christelle Bard (post-race interview) had a huge breakout race to round out the women’s podium. 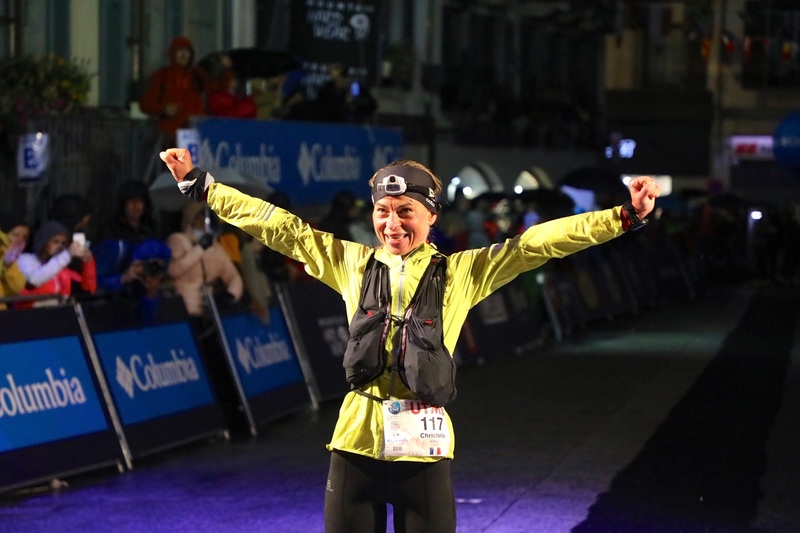 Her performance wasn’t unprecedented, though, as she’s had two strong finishes at the UTMB festival of events in taking third at last year’s TDS and fourth in the 2015 CCC. Christelle started the race conservatively, saying after the race that the race’s fast starting pace put her pretty far back in the field. By about the race’s halfway point, however, she’d moved inside the top 10. At 90k in, at Refuge Bonatti high on a ridgeline in Italy, Christelle was seventh. Just 10k later at Grand Col Ferret, the pass where runners leave Italy and drop down into Switzerland, she’d moved up to fourth. And by Champex-Lac a little over 20k after that, she was in podium position, where she would finish. It was a smooth and even-keel effort that got the job done for Christelle. Holy smokes, how about Japan’s Kaori Niwa? As objective as I try to be with my reporting, there’s everything to just love about this woman. She’s got a perma-smile. There’s no hype or pomp to accompany her running. She simply runs and smiles and kicks the pants off competitive women’s fields like this one with her steady, speedy, relentless progress. 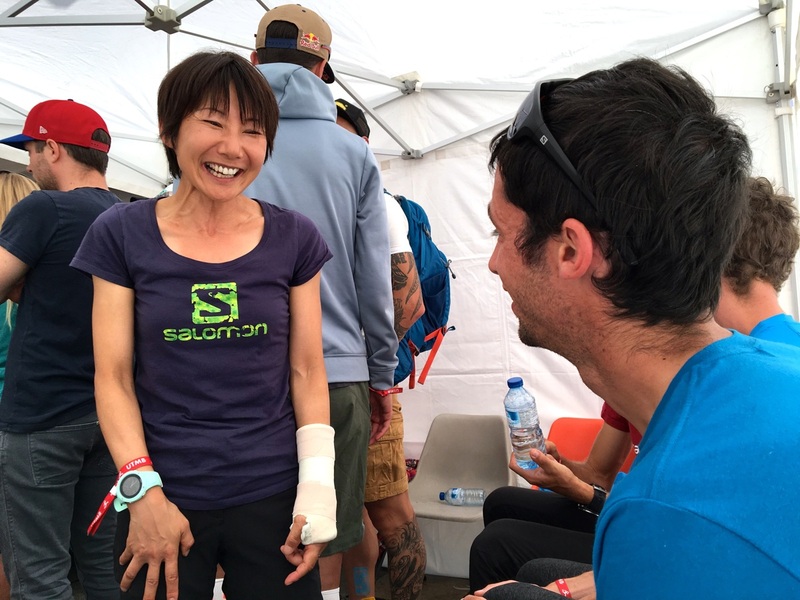 Eighth place at last year’s UTMB and fourth at this years, what is Kaori’s potential here? By the way, Kaori also finished fourth at UTMB wearing a cast and nursing a broken arm from a fall at the Tromsø Skyrace a month ago. Ahem, extra toughness points there. Australia’s Kellie Emmerson took fifth place, after running in sixth as late as a couple kilometers away from the finish line. She made a latest-of-race kicks to propel herself into that final fifth spot. After a couple rough gos at big races so far this year, Canada’s Alissa St Laurent (post-race interview) was due a good race, and I think she got it in finishing sixth. Great Britain’s Anna-Marie Watson took seventh. Amy Sproston was the USA’s top finisher. She rallied in the race’s second half after fighting a bad stomach from the starting line to finish eighth. Bulgaria’s Maria Nikolova was ninth, and Australia’s Robyn Bruins was 10th. Major hat tip to the Aussie ladies, as they put more women in the top 10 than any other country. Last year’s UTMB champion, France’s Caroline Chaverot (pre-race interview), ran in second position as late as 90 kilometers. You know, Caroline always looks like she’s working hard–we’ve heard her breathing like it’s 10k race some 100 kilometers into these sorts of races. So when we saw her putting a lot of effort into things, we thought it was standard procedure for her. Turns out, Caroline wasn’t feeling well and it got the best of her after the 90k aid station at Refuge Bonatti in Italy. At the next aid station, Arnouvaz, she dropped from the race, citing physical problems. Caroline’s raced a lot this year, including very recently the Hardrock 100. It seems maybe like some recovery is in order for her. Several other top women also didn’t make it to the finish line. France’s Juliette Blanchet, last year’s fourth-place woman, stopped at Lac Combal, 65k. After running among the top women early, Emelie Lecomte, of France, dropped in Courmayeur, Italy, making it two UTMB DNFs in a row for her. And Brazil’s Fernanda Maciel (pre-race interview) DNFed at Arnouvaz, 95k. 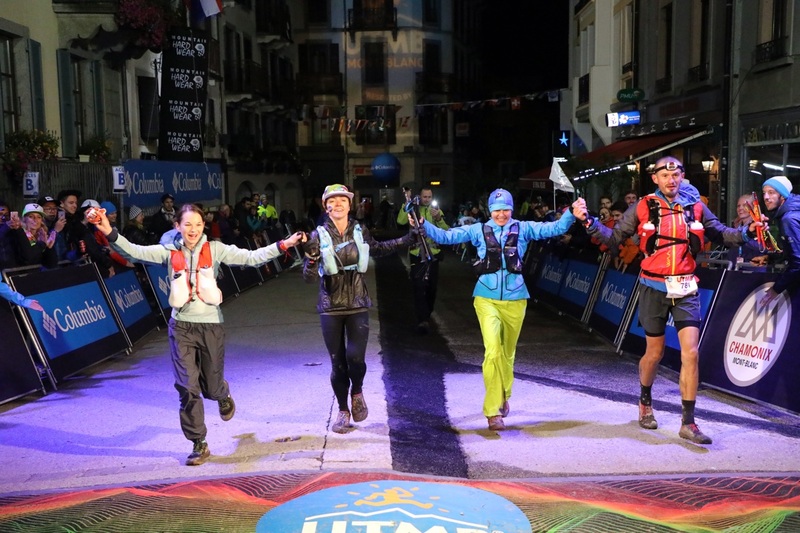 To end this on a happy note, while there are hundreds of lovely mid- and back-of-the-pack stories, one we love is the UTMB march that the USA’s Amanda Basham, Magda Boulet, and Kaci Lickteig made with each other. While Kaci hadn’t planned to ‘race’ race UTMB due to a lack of training while caring for an ill family member this summer, Amanda and Magda tried and it wasn’t either of their days. This trio teamed up, worked together, and crossed the line hand in hand. Also, Stephanie Violett (pre-race interview) battled a tough day to finish about 40 minutes ahead of her American compatriots. A big team worked all weekend to help cover the CCC and UTMB. Thank you to Ellie Greenwood for heading up ‘office duty’ for a long day in Vancouver, Canada. Thanks to all our field assistants many of whom worked without sleep for 24 or more hours and in terrible weather conditions: Marissa Harris, Kirsten Kortebein, Ian Campbell, Jeremy Palmer, Ash Daniel, Mauri Pagliacci, Alex Sass, Amelia Watts, Antonio Grassi, Tom Leitch, Elizabeth Watt, Glen Alverus, Christel Gunnarson, Helen Scotch, Chris Scotch, Meredith Terranova, Paul Terranova, Staale Brinchmann, Stephane Ehrstrom, and Anthony Demeusy. Meghan Hicks is iRunFar.com's Managing Editor, the author of 'Where the Road Ends: A Guide to Trail Running,' and a Contributing Editor at Trail Runner magazine. The converted road runner finished her first trail ultramarathon in 2006 and loves using running to visit the world's wildest places. Very good report. Thank you. As days pass, I’m interested in hearing about Stephanie’s day and what she went through as well as Jeff Browning’s story. Sage gave us a bit of detail into his via instagram, but I’m sure there is much more to what he went through mentally in order to finish. Great coverage, as always, and what a spectacular event! It would be great to see a François – Kilian rematch at Hardrock in 2018. I’m sure both of them would enjoy it ! That was a great report. Thank you for filling in the blanks for us! On a side note, the ads on this page were incredibly crippling. I know bills have to be paid, but it was almost impossible to read because the ads were constantly running. What do you mean the ads “were running”? There shouldn’t have any auto-play ads on the site. (I’ve not personally seen one in ages.) Please send us the link to which you’re directed via the ad so that we can ban any such ads. Thanks. Hi Bryon, I can’t say now because I installed Adblock Plus and it’s blocking a whole lot of running ads (currently 17 on this page) and running much much smoother. Thanks for the great coverage guys. What a race! In “total fairness” to Kilian, and certainly not to discount D’Haene’s stellar performance, I’d bring up the fact that Kilian won another Hardrock a few weeks before (and in less than ideal conditions), besides an already packed year. Taking second, a mere 15′ behind D’Haene, against this field, after that year, is itself hard to wrap one’s mind around. In “total fairness” to Francois, Killian is a Professionnal, he just spend his life trainning and recovering. Francois has a familly life , a work. True, but so are many other runners. I don’t think François would like to be “pro” in that sense. He’s doing it the way that’s most fulfilling for him, and this may be the way that allows for the best recovery. Likewise, Kilian’s being pro doesn’t mean he’s under less stress and demands than a non-pro athlete. He has a partner, he has to travel places all the time, respond to media requests, he has his whole Summits of my life project, and so on. We’re not going to factor in all non-running-related variables in order to compare runners. Sport isn’t fair. But running-wise, mentioning Kilian’s training (or lack thereof, for that matter) and races sounds relevant within the parameters of the sport. Again, we’re just assuming that on the start line everyone’s equal. This is obviously false, but at least a running record provides some benchmark for assessing performances. And so the fact that Kilian ran and won Hardrock and so on at least goes some way toward explaining his performance. No excuse or discounting François’ performance here. Plus going over 8,000 meters several times over the course of a few weeks, then doing hardrock and several other races. I followed the twitter feed and didn’t see a single ad. I really enjoy following these races in this fashion and appreciate the coverage. I ask because the top four men all came in below the previous CR. Although only one if there was a theoretical hour added in. But maybe the 2003 record is an outlier in itself also? I’m pretty sure that one hour is a conservative, but close estimate between last year’s and this year’s course. 1. Last year, the addition of the Pyramids Calcaires slowed the lead men by 46 minutes in their arrival to the next checkpoint after it, at Lac Combal. This section was removed in the last-minute weather change. 2. 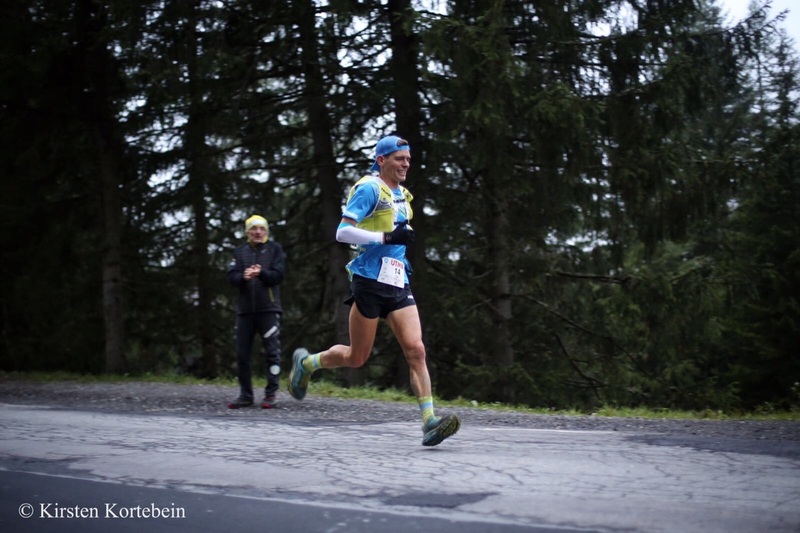 Last year, the lead man ran the final section, between Vallorcine and the finish, in 2:35. This year, the lead man ran it in 2:10. There was a weather-induced course change in this section to take out the climb all the way to Tete aux Vents and to instead run a lower trail. The same change was made in the CCC course and last year’s versus this year’s time differences are consistent with UTMB’s. Finally, as I understand it, an non-weather-related change to the course was made between last year and this year between La Fouly and Champex where the course was moved from trail to road for several kilometers, and I heard multiple runners note that this section was also faster. Good stats. I saw in the Huser interview she felt the end section was pretty comparable. Do you feel there’s an unofficial asterisk by the CR? There were some other changes, too that seemed slower. A big one was that instead of running about 5km or so on road from Chapieux up to where we turned right onto the climb up to Col de le Seigne, they had us on road briefly (1 – 2 km) but then funneled us onto trail on the other side, that climbed (like the road), but then descended a bit before the start of the climb to Col de le Seigne. It definitely wasn’t as fast as the road. The last climb was by far more technical than the normal route. They took us up, and then down towards Argentiere, before climbing to Flegere, and the descent part was a slick boulder scramble. May have been easier in the light, but at night it was pretty bad–foggy/slick. I can’t imagine the schedule that you kept up to give us this year’s incredible coverage…THANK YOU, iRunFar! In light of Meghan’s glowing review, was there no chance to interview Kaori Niwa?? Isn’t Kaci sponsored by Nathan? I ask because I’m surprised to see in the picture here she used a Salomon pack for the race. Neither Kaci or Magda competed under an official sponsor, according to the UTMB site. Related: There were SO MANY VaporKrars out there! Nathan has gone hard on sponsorships. Really unfortunate it seems to be poorly designed. How so? I have the 12L and love it. However, I do wish they’d used a better quality webbing for the straps. A quick question on the use of sticks, Kilian chose not to use any. Francios seemed to be the be the strongest in general but he was also on a mission, so slick switching between the use of his sticks etc, every move, every stop, every change was calculated. 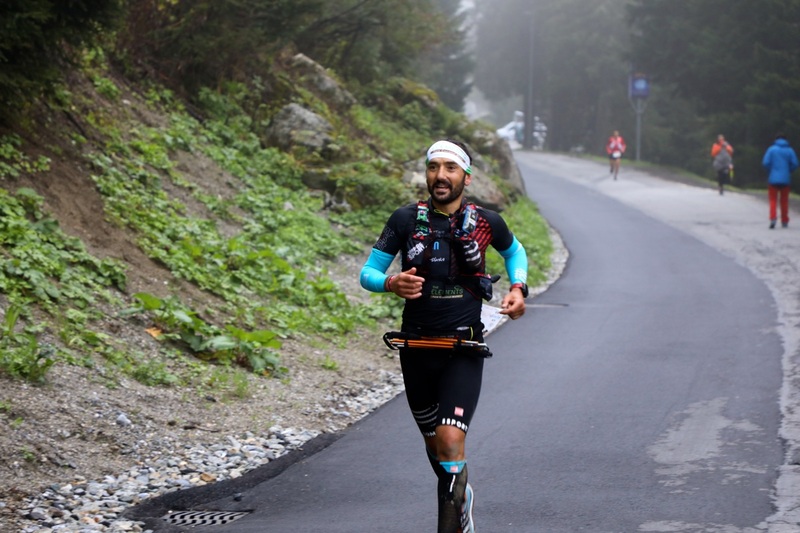 I’m sure that Kilian, with his immense season, could have benefitted from the use of sticks to give his legs a break over 100miles of untenlentless climbing and descending? Francois looked a lot more efficient- and for a big guy too! Maybe his recently dislocated shoulder that should undergo surgery doesn’t allow him to use sticks? Having never raced in Europe, it seems many countries are well represented, with the exception of Germany. Is there a reason there seem to be fewer German trail runners (or, top performing German trail runners)? Is it a cultural difference? Something else? Just curious. Great question! I’d like to know as well. Same goes for Poland – The Polish climbers to “send” the most difficult mountaineering routs so I’m wondering why it doesn’t also leak into trail running/ultra mountain running. As someone who was lucky enough to run UTMB in 2014 and 2015, I’m pretty certain that Pyramids Calcaires was included in the 2015 event for the first time (though not shown on the route map issued to competitors beforehand). The extra ascent and tricky technical descent were a bit of a shock in 2015 after my 2014 experience! 2014 I DNF’d at Coumayeur but 2015 I got all the way around, learning from my 2014 experience. Overall I’d say 45 minute saving from the two changes is probably a fair assessment for elite runners. Great coverage, interviews, reports, thanks so much, this sport would not be the same without iRunFar! It would be great to read a post about overtraining and undertapering. Am I wrong when I think some top athletes pushed the envelope too far and would have benefited from some easier weeks prior to UTMB? David Roche wrote about how Clare Gallagher recovered from WS with low mileage and specific quality work out and went on to win CCC. A guy who does not get enough credit for his performance is Xavier Thévenard. 2 times UTMB winner who finishes 4th, no big deal people might think, but he was sick for 3 weeks before the race. On his Facebook page his says that 4 days before he did not know if he could start. So considering this his performance his really remarkable and I think that fully fit he would have fought it out with François and Kilian for the win. I don’t know if these two will be back next year but I’m sure that Xavier will, and with a vengeance ! He will be a tough nut to crack for any american male trying to be the first UTMB champ. He will be nearly impossible to crack if he’s in good shape. Sorry, America.